Microsoft has been keen to evade global smartphone market with a bunch of colorful and inexpensive handsets in order to gain some credibility in the present throat-cutting smartphone ecosystem. Microsoft recently brought its cheapest Windows Phone so far as it wrapped off the covers from the Lumia 435 and Lumia 532. The former, we’ve been told costs about $80 while the better-of-the-two model costs around $94. The Lumia 435 is a mediocre smartphone with screen panel of 4 inches. Under the hood of this phone, you will observe a chipset worth of 1.2GHz with Snapdragon 200. Other hardware peripherals include 1 GB RAM and default storage capacity of 8 GB which can be expanded up to 128 GB via microSD. Not only this, but users can also enjoy free space of 30 GB on OneDrive storage. The camera department is supported by a 2 MP camera at the rear and another VGA shooter placed at the front. A long-lasting 1,560 mAh battery enables users to talk up to 21 hours on 2G, which is quite good. The Lumia 435 runs on the Micrsoft home-baked Windows Phone OS 8.1 with Lumia Denim update. With the provision of this update, users can get the Office Suite, OneNote, Outlook, Lumia Camera app, Here+ and built-in Skype integration. The smartphone is going to come up in a plethora of multiple colors like bright orange, bright green, white and black and will be available for commercial sale in February 2015 and will bear a price tag of almost PKR 8000. The second one of this series, Lumia 532, is a bit more sophisticated device in comparison to the 435. The smartphone sports an identical 4″ screen glass. The internal components include a 1.2GHz quad-core processor with Snapdragon 200 chipset, a 1 GB worth of RAM and 8 GB memory space. The specs are nearly the same except the addition of two additional cores to its processor. 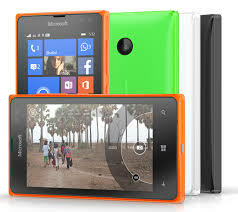 The Lumia 532 features the 5 MP rear-facing camera along with the low-end VGA shooter at the front. The battery possesses the same 1,560 mAh power as in the Lumia 432 the phone. It operates on the Windows Phone 8.1 operating system along with the support of Denim update and similar apps as the lower-end Lumia 432. The Lumia 532 will also hit the market shelves in identical color schemes and a price tag of PKR 9.400. It should be noted that both these smartphones are compatible with the 3G band in Pakistan.